"This interactive and programmable robot can express hundreds of emotions." "A highly-rated construction toy and storybook that young girls will love." "It introduces basic engineering concepts in a toddler-friendly toy." "This set supports critical thinking and fine motor skills." "This top-rated STEM kit has more than 100 exciting projects." "Parents say it’s the best STEM robotic device on the market." "Includes more than 19 fun experiments that will teach chemistry concepts." "Customers say the little robot is super engaging and fun for young children." "It combines on-screen activities with physical games." One of the best STEM toys available right now, for both girls and boys, is Cozmo from toy brand Anki. This adorable little robot is packed with features that make it both educational and extremely fun for kids 8 and up. Cozmo is a little robot with a big personality. He’s powered by artificial intelligence, so he can express hundreds of emotions and even recognize you. Young girls will love playing games like Quick Tap and Keepaway with their robotic pal, and they can use Cozmo’s Code Lab to dive into the world of programming. The Lab comes with both beginner and intermediate programs, allowing kids to progress as they get the hang of coding. 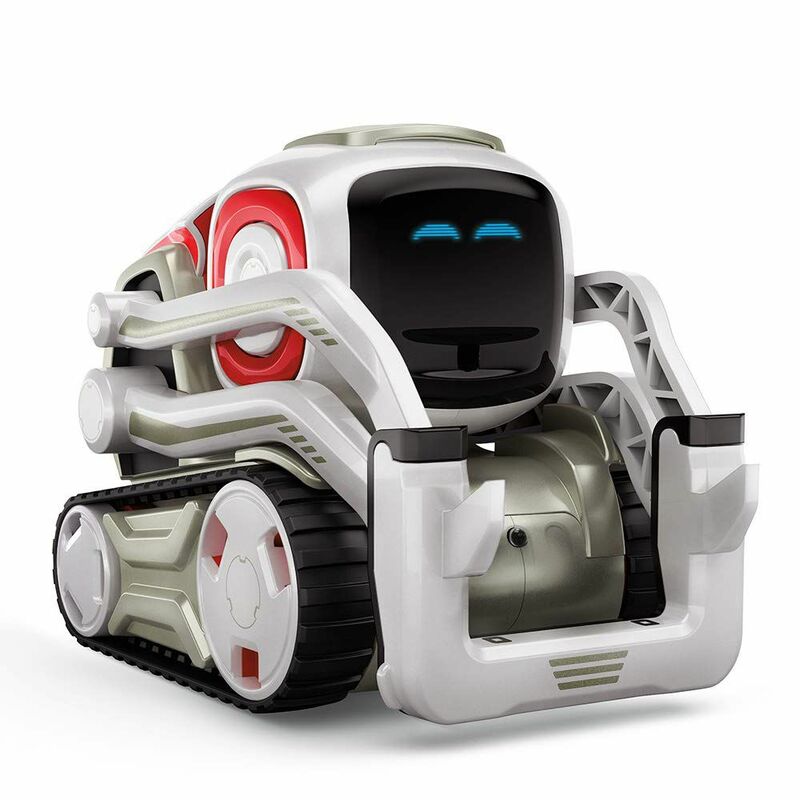 Reviewers say Cozmo will quickly become a favorite toy for kids, thanks to its adorable nature and engaging activities. Several say the associated app is well-designed, allowing kids to play on their own right from the start. Cozmo may be a little pricey, but practically everyone agrees he’s worth the splurge if you’re looking for a great STEM toy. You don’t have to spend hundreds of dollars to get a great STEM toy for girls. GoldieBlox and The Spinning Machine is a highly-rated construction toy and storybook set that young girls will love, as it features a girl engineer character! This inexpensive STEM kit teaches girls about belt drives, guiding them as they create a “spinning machine” to help Goldie’s dog catch his tail. The kit is ideal for kids ages 4 and up, and it’s won several awards, including Educational Toy of the Year and People’s Choice Toy of the Year. Plus, the set is compatible with other GoldieBlox toys. Reviewers say GoldieBlox and The Spinning Machine is a cool concept that teaches kids a real-life engineering application, but a few note that the set has limited replay value. Little girls are never too young to start learning about STEM concepts! The award-winning Guidecraft Grippies Builders set is an open-ended activity for toddlers 18 months and older, and it introduces basic engineering concepts in a toddler-friendly toy. The 20-piece set comes with a variety of oversized soft plastic rods and balls with four unique textures. The pieces snap together using magnets, allowing toddlers to create a huge variety of shapes as they engage in a little tactile exploration. Reviewers say the Guidecraft Grippies are a great open-ended magnetic toy for toddlers, writing that the pieces are easy for little hands to hold and safe for young kids to use. Want to take a look at some other options? See our guide to the best gifts for toddler girls. Older girls will need more complex projects to keep them engaged, which is why the Gears! Gears! Gears! Build & Bloom Building Set is perfect for young girls around age 4. This set supports critical thinking and fine motor skills, all while teaching kids about gears. This set comes with 117 colorful pieces shaped like gears, cranks, flowers, garden critters, stems, and more. The parts are all interchangeable, so young girls can create complex garden designs then use the cranks to put their creativity in motion. Reviewers love that there are endless ways to put this set together, and many note young girls love learning about mechanical concepts as they create fun, colorful garden designs. Once girls reach grade school, they’ll be able to understand and apply more advanced STEM concepts. For a more challenging toy, we love the Snap Circuits Jr. SC-100 Electronics Exploration Kit. This top-rated STEM kit is perfect for 7-year-old girls as it teaches kids about electrical circuits with more than 100 exciting projects. The Snap Circuits kit includes more than 30 pieces that easily snap together—no soldering necessary. Kids ages 8 and up can use this kit to create real, working electrical circuits, completing projects like powering a flashing light or a siren. The manual includes instructions for more than 100 projects, and parents say it’s the perfect balance of fun and challenging. For girls who are into robotics, there’s no better STEM toy than the Wonder Workshop Dash Robot. This STEM activity bundle will teach young girls to code with the help of the cute blue Dash robot. The Dash Robot responds to voice commands, and there are several included challenge cards that will teach kids how to program the robot using concepts like loops, events, conditions, and sequences. The open-ended learning platform makes learning to code easy and accessible, and this kit even comes with a catapult launcher that snaps onto the robot. Parents call the award-winning Dash Robot the “best STEM robotic device on the market,” writing that it’s an outstanding product with an impressive variety of abilities. Interested in reading more reviews? Take a look at our selection of the best robot toys. Want your daughter to learn about chemistry? There’s no better toy to get her excited about experiments than the Yellow Scope Foundation Chemistry Kit, which is specifically designed for girls ages 8 to 12. This award-winning STEM toy includes more than 19 fun experiments that will teach kids about essential chemistry concepts. The Foundation Chemistry Kit includes real lab equipment—everything girls need to learn about chemical reactions, molecular motion, and more. The lab notebook also contains fun facts, quizzes, and room for kids to create their own experiments! Reviewers rave about this kit, saying it keeps young girls busy for hours and that the supplies are high-quality and worth the price. Coding is a valuable skill, which is why so many toys aim to introduce young kids to basic coding concepts. One of the most popular coding toys right now is the Learning Resources Botley the Coding Robot. It will introduce young girls to coding concepts without the need for a smartphone or other device. The 77-piece set includes a remote programmer that you use to control the robot, as well as 40 coding cards, obstacle-building pieces, a starter guide, and more. Kids will learn about concepts like looping commands as they drive Botley around using the screen-free remote, and parents say the little robot is super engaging and fun for young children. Best for ages 5 through 8. Make screen time educational with the Osmo Genius Kit. This STEM kit comes with five award-winning games that girls ages 5 to 12 can play on an iPad. What’s unique about the Osmo Genius Kit is it combines on-screen activities with physical puzzle and game pieces, helping kids exercise both spatial and visual problem-solving skills. The games teach math, spelling, drawing, and more, and reviewers say it’s a great way to encourage kids to make screen time more educational—while still being fun. Our writers spent 2 hours researching the most popular STEM toys for girls on the market. Before making their final recommendations, they considered 15 different toys overall, screened options from 14 different brands and manufacturers and read over 40 user reviews (both positive and negative). All of this research adds up to recommendations you can trust.